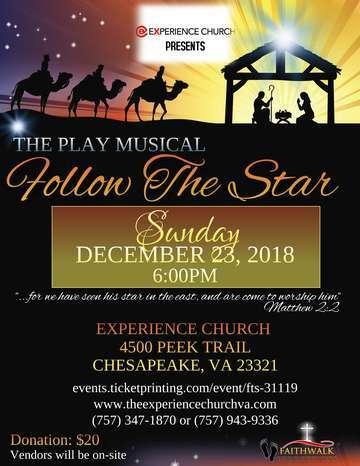 Join Experience Church in partnership with Faithwalk Productions for the Christmas Play Musical "'Follow The Star"
Get ready to laugh, cry, sing, shout, and remember what CHRISTmas is all about. Faithwalk Productions unveils the Christmas Play Musical "Follow the Star", an exhilarating portrayal of the miraculous birth of Jesus Christ. It’s the nativity story as you’ve never seen it before. With a mixture of Modern & Biblical characters as well as contemporary & traditional gospel music, this production highlights how we, as the church, need to take a stand for keeping Christ in Christmas. The productions also gives that message that no matter where you are or how dark that place may be, there is a star that's shining bright to lead you to where Jesus is!!! On the night that He was born, God set a star in the sky that shined so bright for all men to see. If you’re familiar with the story, you know that’s how the wise men found Him, by following the star. If you’re tired of the same old Christmas play, come on out for this spectacular event where Faithwalk Productions has partnered with various local and National Recording artists to reach the masses with the message to “follow the star”. Featured Artists: Mother Stephanie Moore, Psalmist Latoya Murphy-Griffin, Derek Logan Savage, Patricia Riddick, The Inspirational Comedian Joseph Curtis Wills, Steve Alexander, Victoria Farrow & more!! !